Did you know that red beets are one of the most cleansing, detoxing foods you can eat? These miracle roots contain compounds that open up your blood and lymph vessels, allowing all those built-up toxins to be easily removed from your system. They also contain super-antioxidants (yes, there is such a thing!) and these support the liver in carrying out all of its important detoxification functions. Moreover, beets help thin bile and boost your digestive enzymes. Good bile flow is absolutely critical for proper digestion. Many of us who have digestive issues such as gas and bloating may need to look at the cause, which could well be sluggish bile flow. So, we have a solution my friends, with this gorgeously red, inexpensive root veggie. 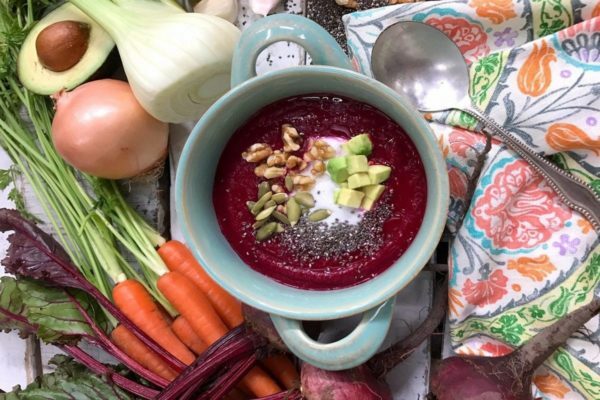 And if you want a delicious way to eat it during the miserable winter and stunning spring months, I highly recommend my Beet & Fennel Detox Soup. It is absolutely delicious: warming, spicy, earthy, and satisfying. I recommend eating with a side of quinoa and a crunchy green salad. This makes for a perfect week night dinner or a hearty lunch. • Place the unpeeled beets in a pot, cover with water. Bring to boil then simmer for 30 minutes until tender. • Drain from water and set aside to cool. • Heat the coconut oil in a cast iron skillet. Add the onions, carrots and fennel. Fry gently for about 2- 3 minutes. Add the garlic, cumin and fenugreek seeds, and fennel. Fry for 5-7 minutes over low heat. Remove from the heat. • Peel the beets, cut into cubes, and add into the blender, together with the cooked vegetables, lemon juice, salt, and warm vegetable broth. • Process to obtain a smooth cream. • Season with salt and serve garnished with mixed seeds, and coconut milk, and avocado. 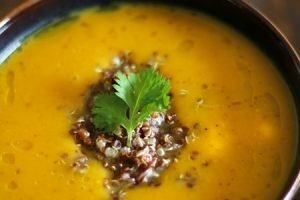 Note: If you have a Vitamix, you don’t need to heat the broth. Simply place all the cooked ingredients in the blender, and blend until desired temperature. How do you detox? Let us know in the comments!